Acquired directly from the artist by the present owner in the 1970s. Osaka, Museum of Art of Daimaru, Paul Delvaux, October - November 1983, no. 29; this exhibition later travelled to Himeji, City Art Museum, January 1984; Tokyo, Isetan Art Museum, February 1984 and Toyama, Museum of Modern Art, April 1984. 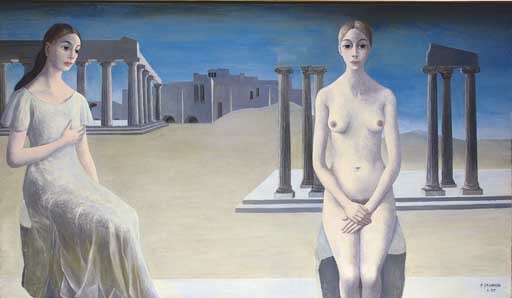 Ferrara, Palazzo dei Diamanti, Paul Delvaux, April - June 1986. Paris, Grand Palais, Paul Delvaux - Paintings and Drawings 1922-1982, November 1991. Osaka, Museum of Art of Daimaru, Paul Delvaux, October 1996, no. 36; this exhibition later travelled to Yamaguchi, Shimonoseki Daimaru Bunka Hall, November 1996; Chiba, Municipal Museum of Sakura, November 1996 - January 1997; Kyoto, Museum of Art of Daimaru, January - February 1997; Tokyo, Isetan Art Museum, February - March 1997. Brussels, Musées Royaux des Beaux Arts de Belgique, Paul Delvaux 1897-1994, March - July 1997, no. 117 (illustrated p. 174). Niigata, Museum of Art, Portraits et autoportraits de Paul Delvaux, June - July 2004, no. 16; this exhibition later travelled to Miyazaki, Museum of Art, July - September 2004; Fukuoka, Museum of Art, September - October 2004; Nagoya, Matsuzakaya Museum of Art, October - November 2004, and Fukushima, Museum of Art, February - March 2005. La ville des sables (The City of Sands) is a striking work of deceptive clarity which, through the simplest of means, evokes many of the mysteries and central themes of Delvaux's oeuvre. Characterised by the pervasive sense of silence that distinguishes all of Delvaux's finest work, La ville des sables is a surprisingly empty work that explores and evokes a poetic sense of the passing of time, of the innocence of youth and of a strange shy sexuality. Presenting a stage-set-like panorama of classical ruins, Delvaux evokes the ancient past and with it, inevitably, an awareness of the transient nature of all things. This sense of transience is reinforced by the sand dunes that appear, through the passage of time, to have begun to bury a North African or perhaps Middle Eastern city. Against this panoramic backdrop of ancient and disintegrating architecture are set the figures of two women. Poised and sharing the same face, they both sit erect and largely expressionless as if they too were classical architectural structures - which, in purely pictorial terms, Delvaux often pointed out, they are. Each figure is seated on a ruined stone block and a striking and formal contrast is established between them, that conveys the enigma and the formal ambiguity of the whole painting. One figure is clothed and the other naked. The naked figure sits proud and modest facing the viewer and staring out of the painting with self-assurance, vague curiosity and a slight air of expectancy. In contrast, the other clothed figure looks toward her with a slightly mournful and maternal look holding one hand over her heart or breast. This simple contrast in their clothing and posture generates a powerful visual association between the two figures which in turn establishes a vast empty chasm of space between them - one filled with emotion. This empty space forms the very heart of the painting and is visually filled with the empty space of the desolate panorama behind them. In this way a powerful three-way silence between each woman and the dead city and between the women themselves is pictorially conveyed with such surprising force that the painting exudes an air of mystery. It is a mystery that, because of the ancient imagery and evocative title of the work seems to be as old as time.